A new pedestrian bridge – as spectacular a landmark as the Falkirk Wheel – could be built to link Banff with its neighbouring town. The crossing is being considered to give walkers and cyclists a safer route to cross the River Deveron. The current Banff Bridge, a seven arch stone structure, was widened on both sides in 1881 but still features narrow pavements. Now a technical study has been approved by the Banff and Buchan area committee to assess the feasibility of building a new crossing to link the two towns. And it is hoped that the new structure could become a star attraction drawing in more tourists to the Moray Firth area. The new study will consider the technical and environmental issues involved and investigate the most appropriate plan and outline designs. Councillor John Cox said: “The road bridge was built on wood a long time ago and there would be substantial issues if something caused it to close. “The primary concern is the traffic as it wasn’t constructed to cope with that much and is very dangerous when two lorries are passing as they mount the kerbs. “The last study identified there was a need to do something but at £50million to replace the road bridge wasn’t feasible and there wasn’t the funds. Councillor Glen Reynolds, chairman of the Banff Development Partnership, said the project could “transform” both towns. He said: “I would like to think that there is now a genuine political and council officer intention, to address the safety concerns of the existing bridge, as well as improve the transport link for people and business. And Des Cheyne, owner of the Spotty Bag Shop in Banff , described it as a “fantastic” idea. Banff and Buchan area committee chairman Andy Kille said the committee welcomed an assessment of all the options and believes it was more likely to be considered under current council budgets. The findings of the study, which has not yet been commissioned, are expected to be presented to the committee by the end of this year. 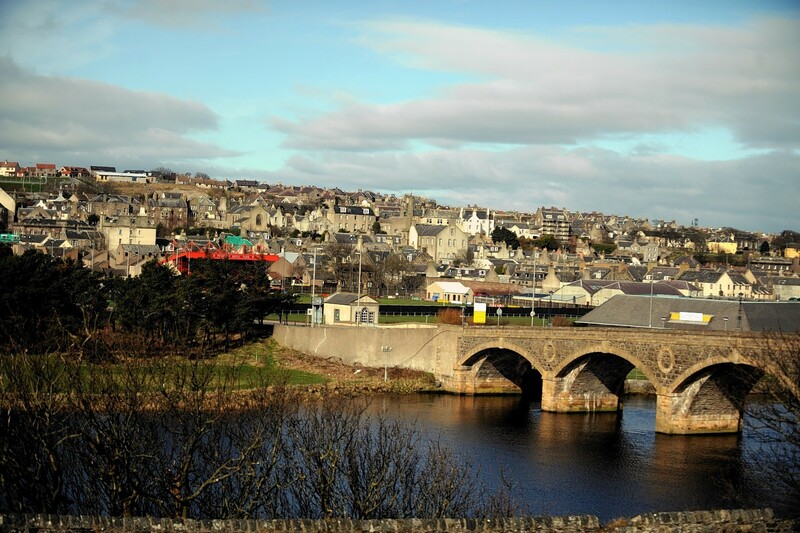 The current Banff Bridge connecting the town with Macduff was built in 1779. Engineer John Smeaton constructed it after the original bridge was swept away during a storm in 1768. The Banff Bridge carries the main coastal road between Inverness and Aberdeen over the River Deveron. Following years of safety concerns and calls for change, an earlier study was carried out to assess the options for the route. It was presented to the Banff and Buchan area committee in 2017 but due to a lack of funding the work was not started. It had recommended and recognised the need for alterations to the existing road bridge, constructing a pedestrian bridge or building a new road bridge. Councillor Michael Roy said: “The saga of a pedestrian bridge over the Deveron goes back many years. “It was proposed that an iconic pedestrian and cycle bridge be built. “A model of such a bridge was constructed and used at public consultation events. “The cost was to be met from European funds. “The local councillors at the time rejected the proposal. “We are now in the position that such a bridge is badly needed.